Thanks to the rise of social media, your personality and how you come across to your readers can have a big impact on your popularity and success as a writer. So it’s important to have an appealing, high-quality photo of yourself—aka an author headshot—that shows you in the best possible light. But, you may ask, can’t I be like the famous authors who don’t put their pictures on their books or author website? You know, the authors who, instead of showing their own faces, use photos of their pets on their social media profiles? People are interested in you. Readers want to know the person behind the poetry or prose. Have you ever flipped to a book’s back cover to see the author’s photo before you read a single page? Your readers will do the same and look for your headshot. A headshot can build fans. When readers see your face, they can connect with you as a person, not just as an anonymous writer. If you look like someone they want to know better, that curiosity can lead them to your Facebook author page and your author website. These social media connections (which will also feature your headshot!) will encourage readers to build a long-lasting and more profitable relationship with you and your work. You’ll be taken more seriously as a writer. Even if you’re not published yet, having a good-quality headshot will show agents and editors that you’re committed to your writing career. What’s The Main Purpose Of My Author Headshot? 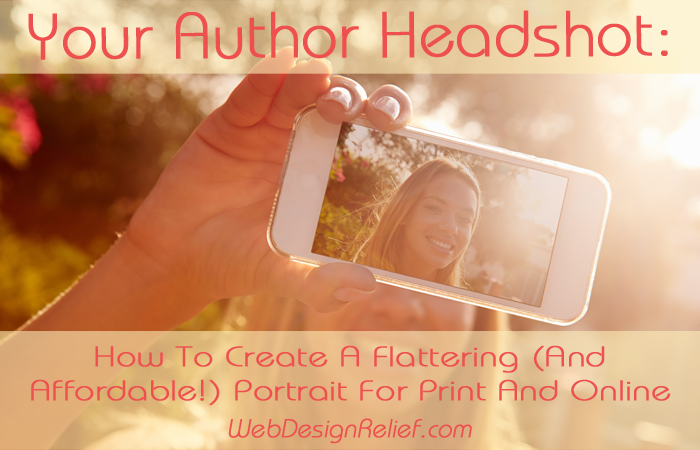 Your headshot will help you make a good first impression and promote your author brand. So the photo should be a reflection of your personality and your writing. Are your books sentimental and heartwarming? You might want to have your picture taken in a sunny garden. Are your poems moody and introspective? Perhaps your background could be an urban landscape, with your photo taken in black and white. How Can I Get A Great Picture Without Blowing My Budget? If you can’t afford to hire a professional photographer, here are some ways to cut costs when creating your own DIY (Do It Yourself) headshot. Check Craigslist (but be careful). Photographers who are just starting out may offer free or inexpensive portrait packages because they are building a portfolio. Ask a friend. While a professional photographer is best, you and a talented friend should be able to create a decent photo with little more than a good point-and-shoot camera. Do your own makeup. Hiring professional hair and makeup artists isn’t as important as it used to be now that most images can be significantly altered in Photoshop. But you may want to consider eliminating redness or shininess in advance. Take your own photo, then have it professionally retouched. Rather than pay a photographer for a full photo shoot, ask a professional to Photoshop your DIY headshot. Take a high-resolution image. Be sure that your pictures are taken in a high-resolution format so that they can be used both in print and online. No bathroom mirror selfies. Not ever. Don’t make any drastic changes before you have your photo taken. Forget crash dieting or changing your hair color—you’ll only regret it later when you show up at a book signing and no one recognizes you. Instead, try to present the best version of your everyday, natural self. Choose soft, natural lighting. Diffused light from a sunny window can be flattering, as can light that comes from a simple paper lantern. Keep in mind that shadows on your face can be unflattering in photos. Look behind you. Ask the person taking your picture to scan for light posts or trees that may seem to be sprouting out of your head. Background objects should frame you, not overwhelm you. Focus on your face. On social media, your headshot may be tiny. Focus on a close-up of your face so people can see you. Experiment with angles to find what works best for your features. Keep your wardrobe simple. Choose clothing that is classic or business casual, and keep accessories to a minimum. Relax and smile! Don’t force a big, fake grin. Try to look friendly and comfortable. QUESTION: Care to share? Post a link to your headshot, and tell us why you chose the setting you did! The headshot I use for all my social media profiles (Twitter @JudyLMohr, Facebook, Google+, NaNoWriMo, etc.) was taken by my teenage son. He’s studied some basic photography, and, in my opinion, has an amazing eye (but I’m his mother, so I’m probably biased). We took a trip to our local botanical gardens and spent several hours wandering around and taking photos in different locations. There were a range of good shots, and all of them are on my Facebook page. I chose the one I liked the most and used that for my profile picture. My problem. I am 82. Who wants to see an old and aged, wrinkled lady? I can photo shop and remove wrinkles (well, some of them,) but why can’t I use a photo taken at an earlier time in my life? It still shows, basically, my personality and the “me” behind my poetry. I will not travel to readings or place myself in the public eye at my age. I am a recluse and like it that way. So, why is what I look like so important? Should not my work speak for itself? Of course, you should be happy with the image you use for your author headshot. You can certainly use an image of your younger self, especially if you have no plans to participate in public readings. But keep in mind, beauty is in the eye of the beholder: how you look now is a testament to the creative, poetic, experienced, authentic person you are! People reading your poetry will be more interested in your work and connecting with you on that level; not in judging your appearance.